Centres - near the Eurexpo International Exhibition Park in Lyon Chassieu. The B&B cottage is located in Decines Charpieu, next to fields - on the limit of Chassieu & Meyzieu - but only 30 minutes from Lyon (City Hall, Bellecour and the old town, or Part-Dieu TGV station), 15 minutes from Saint Exupery International Airport, and 10 minutes from Eurexpo. 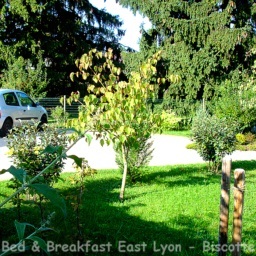 Between the city & the countryside, near the main roads (2 min from motorway A46 / ring road N346), Biscotte B&B accomodates you into our Decines Guest house: for 2 nights minimum, a weekend, a private or professional travel in the East of Lyon (near Lyon Porte des Alpes) - or for a Lyon tourist break, without constraints (public parking and Tram at 900 m). The comfort of the hotel & the friendliness of a guesthouse: four guest rooms, quiet and sunny, furnished in an independant cottage, next to our barn. Each guest room has its private bathroom with shower, flat screen TV and free wireless internet connexion. The breakfast is included and served from 7 to 10 am. 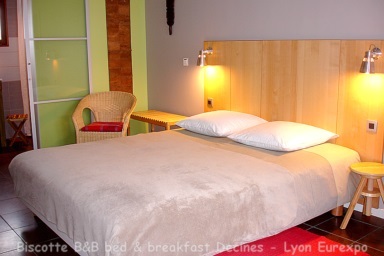 For the comfort of our guests and open access: common livingromm and terrasse, kitchen & tea/ coffee available space. Private & secure parking in the garden of the Guesthouse. * Natural areas: Parc de Miribel Jonage, Grand Large lake, and Lyon & Chassieu Golf courses. * Easy access to highways and expressways: A42 - A43 and A46 - N346 ( ring road, between A6 and A7 ). at the end of an old agricultural hamlet, just before Meyzieu district entrance. * Four charming guest rooms - labeled " Tourism & Business " - 3 keys**. * Stays of 2 nights minimum. 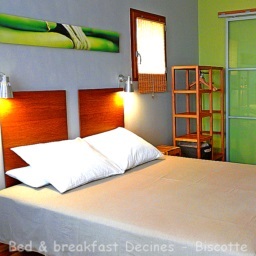 Biscotte B&B Lyon - Guesthouse Bed and Breakfast - from 60 to 90 euros / room / night ( breakfast included ). 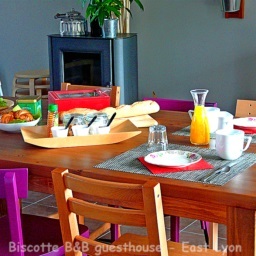 B&B Decines East Lyon - guesthouse Decines Charpieu - bed & breakfast near Lyon Eurexpo.